Following the launch of a new government anti-speeding campaign featuring a male driver plagued by memories of the child he killed, research released today by Brake, the road safety charity and Direct Line Car Insurance has found men are more likely to speed compared with women. The research finds one in 3 male drivers, compared with one in 7 female drivers, admit they drive 35mph or faster in 30mph zones every day or several times a week. At 35mph you are twice as likely to kill a child compared with driving at 30mph or slower. The gender gap is even larger on rural roads. One in five male drivers, compared with one in 16 female drivers, say they drive faster than 60mph on single carriageway rural roads every day or several times a week. 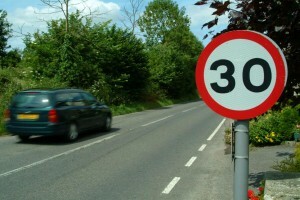 In the last couple of weeks, the Government said it was considering plans to reduce the speed limit on rural roads to a default 50mph and many Local Authorities are already reducing speed limits on such roads to 40mph or 50mph due to the fatal consequences of high speed single-vehicle or head-on collisions, often on bends or brows. When it comes to driving on motorways, men are nearly three times more likely to speed. One in five male drivers, compared with one in 14 female drivers, say they drive faster than 80mph on motorways and dual carriageways every day or several times a week. The findings are reflected in official offence rates. Eight of 10 drivers found guilty of speeding offences are male according to figures published by the Ministry of Justice . The faster you go, the less time there is to avoid a collision, and the more likely the collision will be fatal. More than nine out of 10 (93%) of convictions for causing death or bodily harm by driving are against men . A significant proportion of these convictions are for speed-related bad driving offences. Along with the Commission for Integrated Transport and the Motorists’ Forum, Brake supports the introduction of ISA; satellite controlled speed technology that limits the speed of a car electronically. Brake also supports lower speed limits, particularly 20mph limits in residential areas as well as low limits on rural roads. Liam Stagnell, 21, from York, received serious brain injuries on 14 September 2007 when he was a passenger in a car driven by his workmate, Tom. They were hit by an overtaking speeding car as they emerged from a junction. Liam is amazing doctors with his recovery. The overtaking car driver was found guilty of dangerous driving and received a prison sentence of a year, with a three-year driving ban. Both Liam and Dawn Stagnell, his mum will be available for interviews about the effect of road death on families’ lives.